While on holiday on the isle of Wight we had seen in the welcome pack of where we were staying an advert for Dinosaur isle in Sandown, so thought we would go and have a look around. We got there in early afternoon, as we had visited Godshill Model Village. The building is unmissable from the front as shape does look like a pterodactyl. You enter through the shop then into a room / corridor that explains about the geology of the Isle of Wight, and load of other information and with display case full of fossils etc. You then enter the main open space of the museum, Which has life size model and skeletons of Dinosaurs some are moveable and seem to be on sensors so when you get close to the model parts of the model move and you get sounds. There is loads of information to read about each dinosaur and the different periods of time. You can see into where they would be dealing with fossils so I assume they do demonstrations though on the time of our visit no one was there. Upstairs there is a room for children’s activities for painting etc, and also a dress up costumes for the kids now my daughter and her friend are 15 and they enjoyed the painting and dressing up, to be honest they enjoyed that more than looking and reading of the displays. Myself I found the information very informative and liked the details in the models etc. Though if you are into the history of dinosaurs etc you will know most of this. 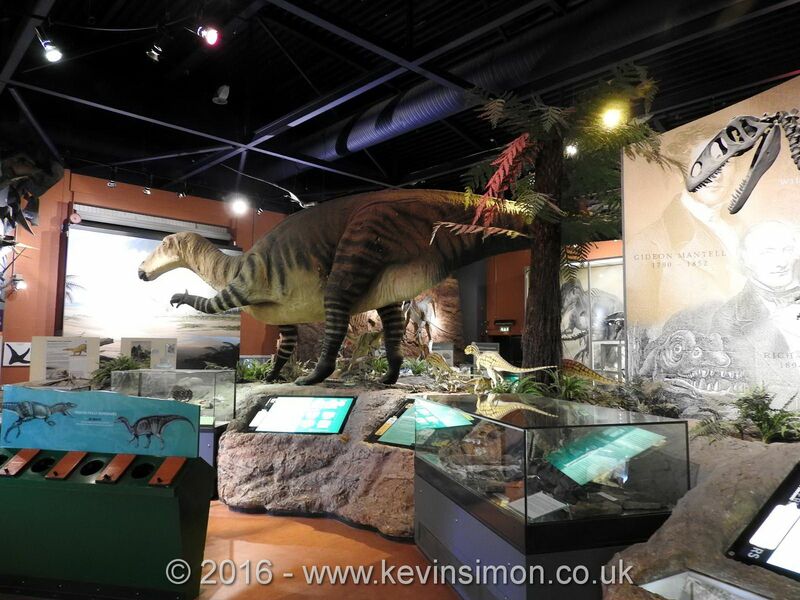 We liked our visit to Dinosaur Isle, though as we wasn’t to sure what to expect though we did expect a bit more as we have been to larger museums etc about dinosaurs. Though for the price it is not bad value I think younger children will really enjoy it. We spent just over an hour looking around, so if you have a hour or so to spare and are in the area it is worth a visit, but don’t expect to spend to long there. As we didn’t spend that long in the museum, it is only a short walk along the promenade to the main town. So you can also have a wonder on the beach etc after you have finished looking around.